Monday already!?!?!? I don't think I am ready to jump back into reality this week. I enjoyed my time just relaxing way too much! On the plus side, I am halfway through the semester! 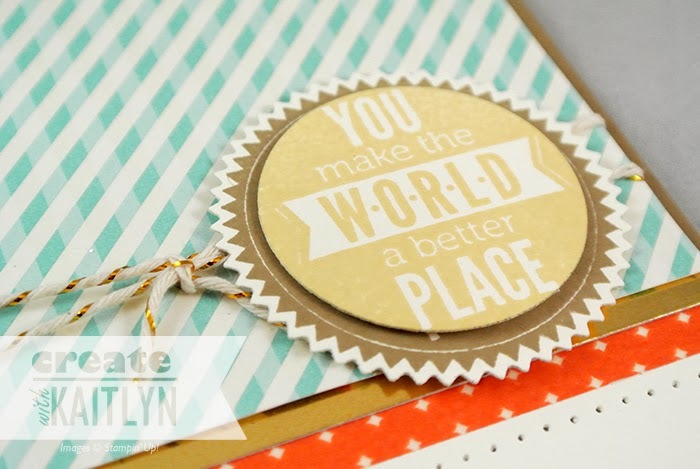 The card I have to share with you today features the Retro Fresh Designer Series Paper. The patterns in this paper have a fun and playful feel. However, on this card, I used the same paper to create a softer look. Behind the Retro Fresh Designer Series Paper, I layered some Gold Foil Sheets. Instead of using one big piece of Gold Foil, I used two 1/4" strips to get the most out of a sheet as possible. The orange pattern is actually from the Retro Fresh Designer Washi Tape. I reinforced the idea of layers by adding some paper-piercing to the top and bottom. I stamped the sentiment from Starburst Sayings twice, once in Baked Brown Sugar and once in So Saffron. The Baked Brown Sugar one was cut out using the Starburst Framelits, and I used the Circle Framelits to cut out the other. This really helps the sentiment pop compared to if it was just one color.